Titled “Women, Jews, Venetians,” the event is sponsored by the Center for Jewish Studies of the University of California, Santa Cruz, the UCSC Literature Department, the Museo Italo-Americano of San Francisco, and the Venice Center for International Jewish Studies. 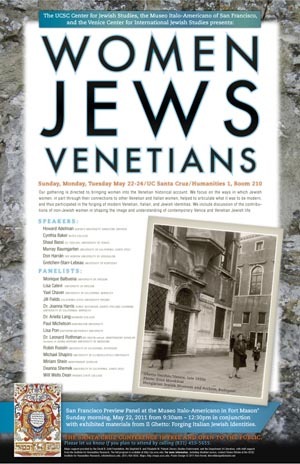 Murray Baumgarten--co-director of UCSC’s Jewish Studies program--noted that many people are unaware of the intensive interaction that took place between the Jews of the Venice Ghetto with the larger Venetian population. He added that the contribution of women has not been fully charted as to how--and to what extent—they were able to participate and take the lead in many spheres, from cultural practices and financial activities, to intellectual pursuits. “Our gathering is directed to bringing women into the Venetian historical account,” said Baumgarten. He noted that the conference will approach the topic through multiple disciplines, including literature, history, and art history. Over the past several years, Baumgarten has directed three summer institutes about Italian Jewish life at the site of the first ghetto in Italy-in collaboration with the University of Venice and funded with grants from the National Endowment for the Humanities. He also provided the academic expertise for a 2009 exhibition at the Museo Italo-Americano in San Francisco, Il Ghetto: Forging Italian Jewish Identities 1516-1870, that examined more than 350 years of Jewish life in Italy--the gateway through which Jewish culture in Europe was established. “What I've tried to do with both the Venice Institute and the San Francisco exhibit is to create portals into history and culture,” said Baumgarten. In addition to the conference at UCSC, there will also be a preview panel at the Museo Italo-Americano in Fort Mason, San Francisco, on Sunday morning, May 22, from 9:30 am to 12:30 p.m.--in conjunction with exhibited materials from Il Ghetto: Forging Italian Jewish Identities. For more information, contact the UCSC Institute for Humanities Research at (831) 459-3527.